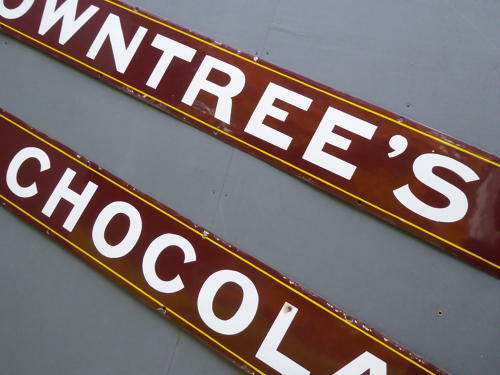 A wonderful & exceptionally rare surviving example of a large antique enamel advertising sign for Rowntrees Chocolates. A beautiful early strip enamel sign in a delightful & seldom seen colourway featuring some fantastic typography. A real 'statement piece', made in two halves, probably due to size limitations of the firing kiln & around ten feet in length once assembled. Simple, striking & just perfect for the kitchen, cafe or restaurant! Wear commensurate with age, comparitively excellent overall with some minor chipping to the enamel on the adjoining ends of each piece. UK courier service available at £40 tracked & signed for 48 hour delivery (the sign exceeds the size limits for a regular courier delivery so will be sent via Parcelforce 'Large').